Ah, not the conclusion we as Christians strive to achieve from people. There is a huge difference between religion and a personal relationship with Jesus Christ. The word religion is a word used only five times in the New Testament. To some individuals religion can cause them to carry out terrible deeds. Think of 9/11 and the Trade Towers. It was in the name of religion that those men killed thousands of people. The ancient Holy Wars of people putting others to death in order to spread their beliefs is one in the same. It is interesting to trace the progression of the definition of religion from Websters 1828 edition to the current printed edition. 4) any system of faith and worship. In this sense, religion comprehends the belief and worship of pagans and Mohammedans, as well as Christians; any religion consisting in the belief of a supernatural or powers to govern the world, and in the worship of such power or powers. In the current Merriam Webster Dictionary the definition of religion has been shorted, toned down, and stripped of much of its original meaning. 2) a personal set or institutionalized system of religious attitudes, beliefs, and practices. Well, I don’t know about you but I believe the definition given back in the 1828 version of Webster’s is much more accurate. Today this world tries to erase pieces of our godly heritage. The thinking of if man is not answerable to God then man can do whatever he wishes and is no better than animals permeates the worldly thinking. James chapter 1 has much to say about religion. It refers to pure, genuine, and sincere. Instead of based on what a man or men say, our religion has Christ at the center. It hinges on the Scriptures. Our beliefs are saving from an eternity in hell. Our convictions are not religious rote practices, instead they are actions which magnify Christ, not the work of man. Paul is probably the best example in Scripture of a religious man. He had all of the earthly qualifications. He ran a crusade to kill, persecute, and imprison Christians. He was a zealot who pursued his deadly convictions with ardor. Then one day on the road to Damascus he learned first hand the difference between God vs. religion. The Lord Jesus Christ spoke to him from heaven. Saul immediately realized it was God. Acts 26:5 shows his walk before salvation. Which knew me from the beginning, if they would testify. that after the most straitest sect of our religion I lived a Pharisee. Galatians 2:20 shows his life after salvation. I am crucified with Christ, nevertheless I live; yet not I, but Christ liveth in me: and the life which I now lie in the flesh I live by the faith of the Son of God, who loved me, and gave himself for me. Now Paul lives! Present tense! To me the contrast between the Bible and religion can be paralleled by the difference of the law and grace. 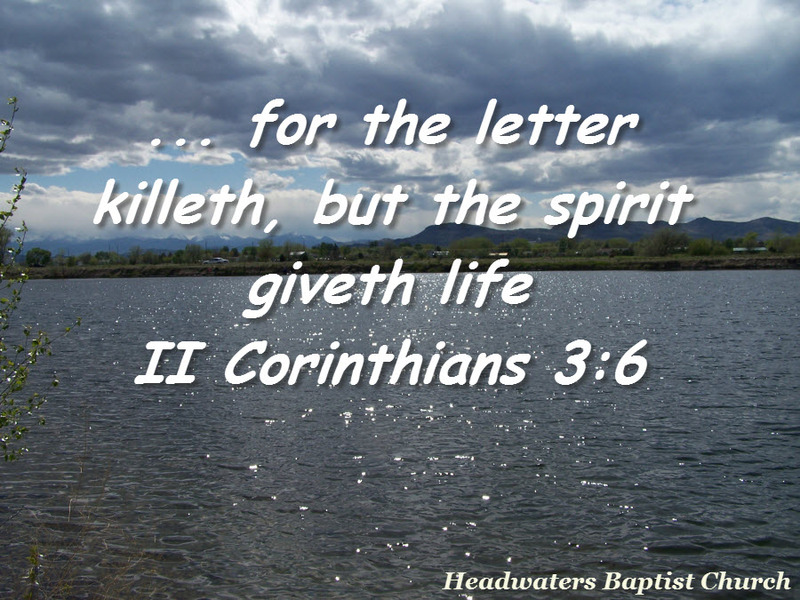 II Corinthians 3:6 reads, “Who also hath made us able ministers of the New Testament; not of the letter, but of the spirit: for the letter killeth, but the spirit giveth life. Don’t let yourself be tangled in the web of doing good, trying to work your way to heaven, or pleasing a man. God is the one who we need to serve. Religion without Christ at the center is not pure true religion. It instead becomes driven by man and governed by man. So be careful. Be watchful. Be diligent. Bring each thought into captivity. Search the Scriptures to prove what is good and holy. Flee evil and worldly thinking. And remember, Jesus Christ loves you and is willing to accept you at any point. No matter what sins may lie in your past, He can wash away the old and make all things new in your life when you accept him as your personal Savior.